U.S. Department of Agriculture’s Crop Production report indicated an increase in 2018/19 soybean production of 4.690 billion which is about 280 million bushels greater than last year. A higher U.S. yield forecast was responsible; a record yield of 53.1 bushels per acre. The 2018/19 total outlook for soybean use is slightly lower than last year (28 million bushels) due primarily to reduced exports. Domestic soybean meal use is predicted to be 100,000 short tons greater this crop year compared to last due to greater feed demand. Reference: USDA/World Agricultural Supply and Demand Estimates (WASDE), 582, October 11, 2018. In today’s busy world we often forget some of the classic research papers that created our knowledge base that provided the foundation for the feed industry we know today. This research was conducted over 30 years ago and still is a guiding principal to understanding soybean meal quality. Researchers at Texas A&M University conducted an experiment to compare four soybean meals (SBM) that were processed in a commercial solvent-extraction plant to give a much wider range in heat treatment than is found among commercially available SBM. The meals were designated in ascending order of heat treatment as Under, Normal, Over and Rumen Escape. The Normal meal was processed using standard commercial operating conditions. The Under meal received less heat treatment by both reducing the steam pressure and retention time in the desolventizer­toaster. Over and Rumen Escape meals received further heat treatment in an additional four­ compartment toaster. The Over meal received less heat treatment than the Rumen Escape meal by reducing steam pressure and retention time in both toasters. Results indicated crude protein content was similar for the four meals, but lysine tended to decrease with increasing heat treatment. In general, urease activity, trypsin inhibitor, protein dispersibility index and nitrogen solubility index decreased with increasing heat treatment. In studies with calculated pigs they found the apparent ileal digestibility of nitrogen and amino acids were similar for all meals (P>.05); however lysine digestibility for the Rumen Escape meal was lower compared to the average of the lesser-heated meals. Energy digestibilities and nitrogen balance data were also similar (P>.05) for the four meals. The researchers concluded that there were no differences in nutritional value among the Under, Normal and Over meals, which represent the range in heat treatment usually found among SBM. The Rumen Escape meal, which received more severe heat treatment, tended to have lower nutritional value than the lesser-heated meals. (Note: This research supports the conclusion that normally processed commercial soybean meals are of uniform quality; Consistent quality is an important trait of soybean meal that promotes greater use in commercial feeds). Chang, C.J., T.D. Tanksley, Jr., D.A. Knabe and T. Zebrowska. 1987. Soybean meal is an excellent source of protein for pigs because of its excellent amino acid profile and its high amino acid digestibility. However, the presence of anti-nutritional factors such as trypsin inhibitors, lectins, oligosaccharides, and antigenic proteins reduces the inclusion level in weanling diets. The oligosaccharides can be reduced or eliminated by processing the soybean meal via aqueous ethanol extraction, fermentation, or enzymatic treatment. Reducing the concentration of oligo­saccharides will increase the concentration of other nutrients such as crude protein. Soy protein concentrate and soy protein isolate have low levels of stachyose and raffinose and antigenic proteins, and greater digestibility of amino acids and energy than soybean meal. Enzyme-treated soybean meal also has low concentration of oligosaccharides, and fermented soybean meal contains no stachyose or raffinose. However, fermented soybean meal sometimes has a reduced digestibility of lysine because of Mailard reactions caused by excess heating during drying after fermentation, but this is usually not observed in enzyme-treated soybean meal where the amino acid digestibility is similar to soybean meal. Blavi, Laia and Hans H. Stein. 2018. Development and Nutritional Value of Advanced Soybean Products Used in Diets for Young Pigs. Mid-West Swine Nutrition Conference Proceeding p29-32. Lesley Nernberg wrote a comprehensive article entitled “Fifteen Factors to Consider When Evaluating and Using Alternative Ingredients”. This article identifies various factors to consider when deciding on the purchase and use of alternative feed ingredients. Composition and Quality: The main reason to consider the use of alternative feed ingredients should be based on nutrient composition and price. Nutrient profiles and quality should be confirmed by laboratory analyses. Variability: A considerable barrier to utilizing more alternative ingredients within feed formulations can be the nutrient variability. Accurate nutrient profiles are critical. Nutrient Digestibility/Availability: The extent to which the animal can digest and absorb the nutrients from a feedstuff is important. Many ingredients may seem to have acceptable levels of total nutrients, but they may not be available to the animal for growth or productive purposes. Relative Value: Relative value refers to the alternative ingredient’s composition and price compared to common standard ingredients. The relative value of an ingredient must be competitive with the ingredient it is to replace. Anti-Nutritional Factors: Certain alternative feed ingredients may contain anti-nutrition factors that interfere with the digest, metabolism, or health of animals. Examples are the mycotoxins, trypsin inhibitors, tannins, lectins, and glucosinltates. It is important to know their presence and their impact on the animal. Palatability: Some alternative ingredients can alter palatability and feed intake. Free of Hazards: Some alternative ingredients can contain foreign materials that may be considered dangerous to animal consumption. Alternative feed ingredients should be checked for physical hazards, heavy metals and chemicals. Handling and Storage: Alternative ingredients need to be compatible with the feed milling process to be a cost effective and practical ingredient for utilization within formulations. Availability and Consistency of Supply: An adequate supply of the material under consideration must exist prior to evaluating the cost and nutritional value. An adequate supply is needed to justify changing the feed formulation. Stability: Alternative ingredients need to be stable and maintain quality prior to use. Inclusion Rates: The amount of ingredient to include within a feed formula is highly open to interpretation and the conditions involved. Proper inclusion rates of alternative feed ingredients is important. Impact on Pellet Quality and Final Feed: An alternative feed ingredient should not significantly alter pellet quality or overall feed performance. Effect on Meat, Egg, or Milk Quality: An alternative feed ingredient should not impact meat, milk, or egg quality. Cost: The amount of potential feed cost savings tends to be the biggest factor in determining use of alternative based ingredients. The author’s conclusion was: “Alternative feed ingredients should always be considered in feed formulations. Overall, when such materials are characterized correctly and incorporated to animal diets with no performance impairment, they can be a way to reduce feed and production costs. There are multiple factors to evaluate in using alternative ingredients. When used properly, the financial benefits of alternative feed ingredients can be considerable to animal feeding operations”. (Editor’s note: Feed formulators are always interested in producing cost-efficient feeds; replacing the soybean meal with lower-cost alternative protein sources is a common goal. Two benefits of including soybean meal in the feed formulation is its consistent composition and ability to blend with feed grains to produce commercial feeds that meet the nutritional requirements for optimal performance at least cost. Soybean meal is the STANDARD that alternative protein ingredients aim to replace. Soybean meal’s composition, available supply and competitive price support soybean meal’s dominate position as “protein ingredient of choice” for livestock and poultry producers). Nernberg, Lesley. 2018. 15 Factors to Consider When Evaluating and Using Alternative Ingredients. 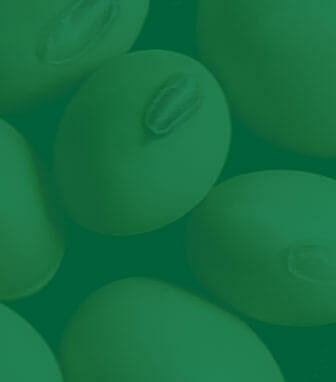 Whole soybeans are an excellent source of protein analyzing about 40% on a dry basis. Whole soybeans can be included in cattle diets as a source of protein and energy. There are circumstances where feeding the whole soybean can be an option such as soybeans that aren’t marketable because of frost damage or other quality factors. These beans can be fed to livestock as a way to capture otherwise lost value. The amount of soybeans that can be fed to cattle is limited due to their high fat content. Based on research, the amount of whole soybeans for cattle should be limited to 14% of diet dry matter to reduce the negative effects of the oil on fiber digestibility and nitrogen utilization. That represents about 2 pounds per head for growing calves and about 3-4 pounds for finishing cattle consuming greater quantities of feed. Avoid feeding raw soybeans to very young, pre-ruminating calves because of trypsin inhibitor which interferes with digestion in monogastrics. Soybeans also contain urease which breaks down urea into ammonia. Feeding raw soybeans along with protein supplements containing urea (such as lick tubs, protein blocks, and some liquid or dry supplements) could result in ammonia toxicity and cattle death. These two obstacles can be overcome by heat treating soybeans by through either extrusion or roasting which inactivates both enzymes. AgWeb guest editor. 2018. Adding value to soybean through cattle. The soybean composition issues and associated opportunities information presented is based on USB’s further analysis of soybean samples collected from farmer fields by USDA-NASS as part of their Objective Yield (OY) Survey. This information provides compositional details on the U.S. soybean crop from the 2015 and 2016 growing seasons in the eleven represented states to illustrate aspects of the “Composition-Opportunity.” The primary initial goal is to stimulate further thought and dialogue within the soybean value-chain regarding the “Composition-Opportunity.” The ultimate goal is beneficial changes in the compositional characteristics of the U.S. soybean crop and the effective capture of this value through a market system which includes composition in the valuing of soybeans. Estimates of soybean crop composition for defined, multi-county geographic units. Results from models that utilize whole soybean composition to estimate soybean oil and meal yields and soybean meal composition. “Snapshot” estimates of soybean product value based on the soybean compositional values presented and defined market price scenarios. From this information, a better understanding of the economic implications associated with compositional variation can be developed. The economic implications will then serve as a starting point for the determination of potential business opportunities. A considerable amount of additional work, including allied industry expertise and participation, is required to justify a change in market behavior on the scale that will be required to move from the market’s present commodity focus to one based on composition. As more information becomes available, it will be added to this site. In the second study (Farmers Independent Research of Seed Technologies (FIRST), soybean samples from the 2017 crop year across multiple U.S geographic regions were provided by Farmers Independent Research of Seed Technologies to determine the extent to which (1) soybean meal end-user relevant compositional characteristics vary and are associated with genetic background, and, (2) yield per acre is related to reported compositional characteristics. Soybean meal end-user compositional characteristics focused on amino acid levels (percent of soybean and estimated levels in soybean meal), with emphasis on lysine, threonine, methionine and cysteine. Soybean samples were analyzed using NIR spectrometry. General observations for soybean samples collected and analyzed prior to 2017 were similar to those observed in 2017. While the overall value-proposition for soybeans will continue to emphasize yield and soybean meal/soybean oil content, soybean meal value can be enhanced through end-user amino acid composition considerations. WattAgNet has published a listing of the world’s largest feed manufacturers. This listing highlights the growth and evolution of the animal feed industry worldwide and the major companies involved in shaping the global feed industry. The report indicated that the largest 100 feed companies in 2017 produced more than 386.8 million metric tons of feed. This represents 42% of the total global feed volume and 4% greater compared to feed production in 2016. Roembke, Jackie. 2018. World’s Top 100 Feed Producers. www.WATTAgNet.com. October 2018.